We’re on Deerpath in Vernon Hills, directly next to the fire station. We’re located at 595 Deerpath Road just off Route 60 next to the Countryside Fire Station. Feel free to call us at the church at 847 367-5787. If you would like to talk about PreSchool, please call 847-367-5791. When is your worship time? Every Sunday at 9:30 a.m. We enjoy refreshments and conversation afterward, at about 10:30 a.m. Without a doubt! We are used to visitors and “old” friends dropping in from time to time. You will be welcomed, but not accosted (though we do tend to share the sign of peace a little long during the middle of the service). We are a rather informal bunch, so feel free to come as you are. We like to say that “church clothes” are whatever we have on. When it comes to sacraments such as Holy Communion, we extend a special invitation. You do not need to be a member of this church or a Lutheran to receive Communion – we ask that you desire a relationship with Jesus. All are welcome – all the time. We are served by Rev. Amy Becker-Perez. Her current role with us is as a part-time interim pastor. Before moving to Libertyville in 2013, Rev. Amy Becker-Perez served congregations in the Milwaukee area for 8 years. She received her Masters of Divinity from The Lutheran School of Theology at Chicago and graduated from Concordia College in Moorhead, MN with a BA in Elementary Education. Many experiences and people were key to developing and encouraging Pastor Amy’s call to pastoral ministry, but some of the most striking happened while she worked at a homeless shelter after college. Pastor Amy lives in Libertyville with her husband, Pablo, and their two young sons. If you would like to reach Pastor Amy directly, please contact the church or email her at Pastor.Amy.Becker@gmail.com. Do you offer special programs for children? We offer concurrent Sunday School at 9:30 a.m. during the non-summer months as well as many special Pre-school and Kids Kamp Programs. We also provide Confirmation Classes to students in grades 7 and 8, as well as high school youth group opportunities. Our congregation also takes part in a variety of multi-generational activities, including fellowship and service projects. Through our PreSchool, we offer week-day programs for children age 3 through 5, while our summer Kids Kamp offers fun for young children as well as older Counselors In Training. What is “Concurrent” Sunday School? Sunday School classes for ages PreK through Grade 5 are held on most Sundays starting in September. Children begin their time in worship with their families, then have the option of attending concurrent Sunday School activities which begin after the Children’s Message (at approximately 9:45 a.m.). After activities, children are then escorted back to worship in time for Communion/Blessing so that they may finish worship with you. That said, children are always welcome to stay in worship with you for the entire time. We are an informal, energetic bunch and we enjoy the excitement kids bring to worship. More information is on the Sunday School webpage. We are rebooting our adult studies and discussion opportunities as we speak. Please be sure to let us know if you have a particular interest – christlutheranvh@aol.com. What is Your Church’s Affiliation? 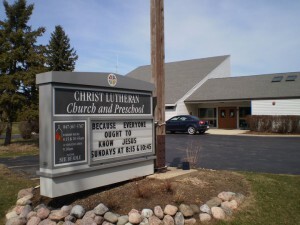 Our congregation is part of the Evangelical Lutheran Church in America (ELCA). Through that larger parent church, we support a vast array of programming, including one of the fastest and most effective disaster response efforts in the world, Lutheran Disaster Response. Do You Have Other Partners and Activities? In addition to our work through the ELCA, we support many local causes, such as the COOL Food Pantry in Waukegan, Love INC Lake County, Empty Bowls grass roots hunger initiative, Caring Hands/Project Linus comfort crafters, Project Warmth street ministry, A Safe Place shelter, Feed My Starving Children, and more. More information appears on our Ministries & Programs webpage. We are partners with several groups – including justWorship ministry, Boy Scout Troop 273, Cub Scout Pack 273, AA, NA, Alanon and other organizations that support the community. Lutherans (and others) mark 2017 as the 500th year of the Reformation, a time when Martin Luther and other church leaders called for improvements – i.e., reformations – in the church’s practices. On October 31, 1517, Martin Luther posted the Ninety-Five Theses in Wittenberg, Germany. The resulting debate about Christian teaching and practice led to changes that have shaped the course of Western Christianity for almost 500 years. The Reformation offers to Christians everywhere a liberating way of listening to and sharing the word of God. It teaches that Christ’s life flows through faith into a life of service to the neighbor and offers the promise of God’s love that makes possible a life of “living, daring confidence in God’s grace.” The Reformation’s goal was never to divide the church, but rather to get back to ways that priests and scholars like Martin Luther believed were more aligned with how the Christian Church should be.